Just under five years ago Kentmere Primary School was among the worst in Greater Manchester, placed in special measures after a poor Ofsted report. However, last year Ofsted rated the school outstanding in all areas – the transformation has been remarkable. After the devastating Ofsted judgement in September 2013, I was appointed as the new head in November 2013 and tasked with turning the school around. The Ofsted report was a sobering read. Among some of the key findings: standards of teaching were said to be inadequate, pupils made inadequate progress from their starting points, and there was limited rigour by senior leaders. Kentmere is a larger than average primary school, one and a half form entry, in a deprived area of Rochdale. Almost three quarters of the school population are from minority ethnic backgrounds, with 30 per cent White British and 47 per cent from Pakistani heritage. The proportion of pupils known to be eligible for Pupil Premium is well above average and the proportion of pupils with SEND is above national average too. The school being based in an area of significant socio-economic deprivation, many families experience challenging circumstances. The school became an academy in 2015 and is sponsored by the Wardle Academy Trust. The past four years have been a challenging but very rewarding experience. One of the key ingredients has been to keep the standards high and consistent throughout the school in terms of policy, procedures and expectations. Our vision is now shared across the school: in the playground, in the classrooms, in the corridors. What it means for us is that there are no excuses for underachievement. We do not put a limit on any child’s learning; we believe that everyone can and will achieve if we expect them to do so. We have an unremitting focus on teaching and learning, and our expectations of staff are high. All staff have felt part of the improvement journey because we promote strong team-work. Staff are given responsibility and provided with high-quality training and development and thus feel empowered. The curriculum is exciting and engaging for the children, including the use of hooks at the beginning of each lesson, a thematic approach to learning, the use of Kagan structures and real-life experiences to bring learning to life. Growth mindset, collaboration and an open-door ethos are all part of the culture we have built up for staff as well as pupils. Our teachers frequently observe one another’s lessons in both an informal capacity and through more formal approaches, such as Lesson Study. As a result staff morale is very high because of the culture of support and development which benefits all members of staff. Staff are uncompromising in their expectations of pupils’ conduct. As a result, pupils show great pride in their appearance and appreciation of their surroundings. And they look after their equipment. They are motivated and self-disciplined learners because they are given opportunities to be independent in their learning, they have clear instructions and expectations and know the standards that are required of them. As a result they grow into confident and self-assured learners. We aim to ensure that no time is wasted in lessons and the culture of independence and accountability ensures an expectation that all children answer questions with the use of talk partners and lollipop sticks. Like other schools in similar catchments, many of our children arrive with a variety of barriers to their learning and we spend a lot of time unpicking these and finding ways of overcoming them. One of the main ways we have done this is through the support we offer to our children and their families. We run a readiness for school programme for parents of children starting the EYFS to prepare them for starting school. We have community liaison officers and a team of staff dedicated to wellbeing, attendance and supporting families. Our stress-busting programme has also benefited our children, particularly those coping with their SATs. We open our classrooms up to all parents who come and join in our lessons with their children. We have Sunshine Day every half-term, where all the children dress in yellow and we focus upon pastoral subjects and safeguarding issues such as child sexual exploitation, LGBT, Prevent and many more. Parents also join us for these days. We are a lead school for the NW1 Maths hub and on the Department for Education’s Maths Mastery programme. As a lead school on the DfE national research project for the NCETM (National Centre for Excellence in the Teaching of Mathematics), we offer support to schools across Oldham and Rochdale in the teaching of mastery maths. As members of the Manchester Teaching Schools Alliance we have shared our systems for improving the quality of teaching, learning and assessment with many other schools. This year we are applying to become a Teaching School. Unwavering commitment towards ensuring every child can and will succeed has been at the root of our success. From their low starting points, for the past three years, year 6 pupils have left with progress scores above the national average. 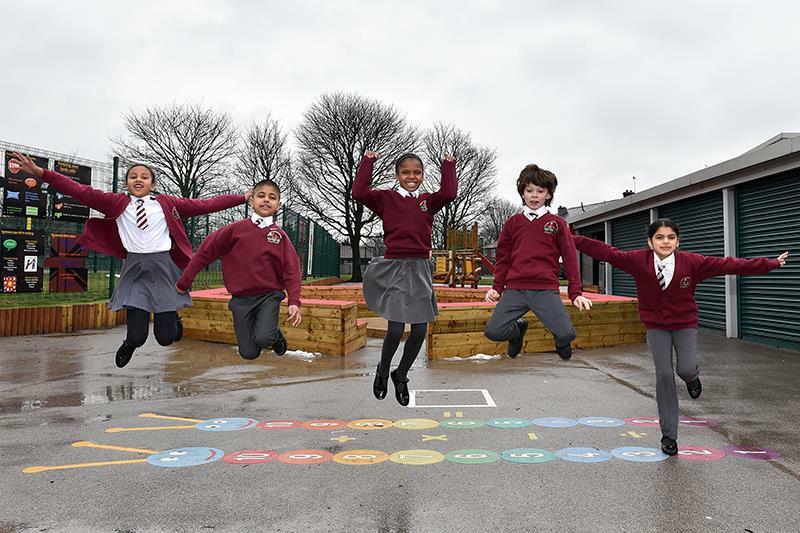 A pivotal point in our journey was in 2016, when Kentmere was named the top school in Rochdale and nationally (when compared to all similar primary schools) and in the top one per cent of all schools nationally. In other areas, the school has achieved the Princess Diana Award for anti-bullying, Sports Mark Gold, Eco Schools Silver, the Leading Parent Partnership Award, Artsmark Silver, School Council Silver Award, Healthy Schools Status, Quality Mark, Rainbow Flag outstanding grade and is a Unicef rights respecting school.